Members of Stephen F. Austin State University's Jack's Council on Family Relations collected and donated food to 137 families through its annual food drive, Thanksgiving Homebound. 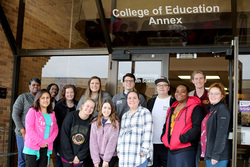 Representatives from the Greater East Texas Community Action Program Head Start (pictured), East Texas Family Crisis Center and Solid Foundation visited the SFA campus Monday to collect the donations. Members of SFA's Interfraternity Council also assisted with loading the boxes of food. NACOGDOCHES, Texas - As part of their annual Thanksgiving Homebound food drive, members of Stephen F. Austin State University's Jack's Council on Family Relations collected and donated food to 137 families, which is the most families this drive has served since it began in 2011. JCFR is a student organization focused on building networks and helping families within the community. It is part of SFA's School of Human Sciences. "Our goal is to give back to the Nacogdoches community," said Lindsey Lightfoot, JCFR president and human development and family studies major. "Sometimes Thanksgiving can be overlooked, and I think this project is a great reminder to help families, be thankful and remember the real reason for the holiday." Representatives from the Greater East Texas Community Action Program Head Start, East Texas Family Crisis Center and Solid Foundation visited the SFA campus Monday to collect the donations. Each organization will distribute the food to the selected families. Members of SFA's Interfraternity Council also assisted with loading the boxes of food. "This has given me a great outlook on the community of Nacogdoches. I've seen so many local organizations come together to provide meals for these families," Lightfoot said.